People all over the planet are observing World Autism Awareness Day today. My autistic friends and my family, however, prefer to follow The Autistic Self-Advocacy's example and observe Autism Acceptance Day. Why acceptance? 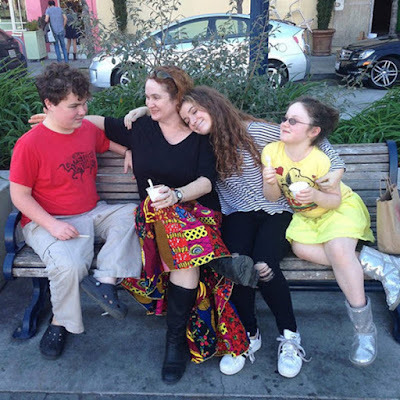 Because autistic people like my teenage son Leo deserve the love and respect that come with acceptance, not merely acknowledgment that autism exists. Awareness is passive. Acceptance is a choice. 1) Honor communication. Everyone communicates. That includes autistic people of all abilities. If your autistic loved one struggles with spoken language, the best action you can take in their honor is to help them find a communication system that works for them, whether scripted speech, typing, a symbol-to-speech device or app, sign language, or a letter board. You also need to understand that an autistic person’s spoken words may not accurately represent what they’re thinking, or their intentions. When my son jumps up and sings “The cold never bothered me anyway!” at me, I understand he's telling me that his current environmental temperature needs to change. If he asks me to repeat phrases after him, he's asking for reassurance. Autistic communication isn't necessarily verbal or language-based; sometimes communication happens through behavior, like a child refusing to get out of bed, or being upset with routines that usually comfort them. It's important to pay attention to this kind of communication; while it may be a show of independence, behavioral changes can also be an autistic person's only external sign of illness. Also honor autistic ability to participate in communication. My son, like many autistic folk, takes a few moments to process spoken words. But he understands most everything people say to him. There is no need to talk to him in a sing-song voice, or speak extra slowly. Besides, where is the harm in talking to him like you would any other teenager? 2) Honor competence. Recognize the things your autistic loved can do, and encourage them to do them. Have patience if the learning takes a bit longer than you might expect—autistic kids' legendary ability to “suddenly” do things like read or ride a bike is often the result of extended practicing, even if, at the time, it seems the practicing wasn't clicking . So please try to avoid doing things for your kids that they are willing and able to do for themselves. Their independence and sense of self-worth need to trump your momentary convenience. "I am finishing my Master’s degree in English and creative writing, yet I cannot cross a street without help, struggle with independent living skills, and possess a strong affinity for anything Disney or Hello Kitty. This spike-and-valley development may be atypical for most people, but it is a totally typical way for an autistic person to develop and sets the stage in each individual for the culture we build together." 4) Honor sensory needs. Many autistic people's senses are more finely tuned than a non-autistic person's hearing, smell, or sense of touch. Noises that don't bother you if you aren't autistic may be unbearable to someone who is. Other people's perfume may feel like chemical warfare. Being in a crowd may feel like drowning. These perceptions are very real, so consider that if you refuse to acknowledge or accommodate autistic sensory needs, you are essentially torturing a fellow human being. 5) Honor executive functioning difficulties. Autistic people often struggle with organization, sequencing, problem solving, and other executive function (EF) skills. So do everything you can to support your autistic loved ones in this area, by helping to develop supports such as checklists or visual schedules. Further EF accommodations can include eliminating simple barriers in the home, like installing towel hooks instead of towel bars, using open laundry bins instead of ones with lids, or storing dishes in a lower cabinet instead of an upper one. Small changes like these can make big differences in the happiness and functioning abilities of people you care about (or, again, your own self). 7) Honor routine. Autistic people like my son can find comfort in routine, whether it's visiting the same restaurant as a family every Saturday, or using the same series of steps and scripted phrases to get dressed in the morning. As far as many autistic people are concerned, anything different is bad, and a source of stress. Especially surprises. If things need to change, do what you can to make the transition easier, in the fashion that works best for the autistic person in question. Would a custom "social" story about the transition help? Or would they prefer to ask you, every few minutes, to repeat the same scripted details about the upcoming change? Again, do what you can to accommodate, especially if that autistic someone is dependent on you. 8) Honor autistic role models. There are so many autistic people online being proud and fearless. Learn from them, bow to them. A very incomplete and haphazard list includes Ruti Regan, Mel Baggs, Ido Kedar, Morénike Oniawu, Paula C. Durbin-Westby, M. Kelter, Julia Bascom, Emma Zurcher-Long, Lynne Soraya, Lydia Brown, Judy Endow, Amy Sequenzia. John Elder Robison, Max Sparrow, and Emily Paige Ballou. 9) Honor the undiagnosed autistic people you already know. We know that autistic people have always been here, that most of the increase in autism rates has to do with changing diagnostic criteria to include more people, and that women especially often go undiagnosed. This means that the current CDC autism estimate of 1 in 68 people is probably too low. This means you likely have more autistic people in your life than you officially know you do. So try to show respect and kindness rather than irritation towards people who, for example, you'd otherwise think are one-upping you when you tell them about your experiences and they reciprocate by telling you about their own related experiences—as such reciprocation is a very autistic way to empathize. Smile and nod and try to honestly listen to the little girl who wants to tell you about every possible gem category and the subtle differences between them. Kindness and courtesy rarely cause harm, after all. 10) Honor autistic people as their own unique selves. Do not disrespect them by trying to view them as flawed, or potential, non-autistic people. Do not be surprised by or resentful of autistic adults who have gained more skills than your autistic child currently possesses. Do not talk about autistic people having less mature minds in more mature bodies. Do not try to cajole them into doing things that cause them distress, like going to loud parties or talking about whether there is an autism epidemic (again, autistic people have always been part of human society). Just show some respect by trying not to impose your non-autistic sensibilities onto them. Because autistic people are, again, individuals. Treat them that way. Accept that some may possess a wicked sense of humor, but totally miss others’ reciprocated (or retaliated) humor or sarcasm. Accept that some function best with noise-canceling headphones at school and work. Accept that some autistic people loathe hugs. Accept that some autistic people crave hugs. Accept that some autistic people may enjoy skipping as a form of locomotion whenever possible. Accept that your preferences may surprise them, and their preferences may surprise you.